SmartGLCD 240x128 is a full-featured board for easy development of embedded graphical applications using PIC18F87K22 device. Board features 240x128px GLCD (with RA6963C controller) with RGB backlight and a Touch Screen. SmartGLCD 240x128 Board is a full-featured tool for easy development of embedded graphical applications using PIC18F87K22 device. Large 240x128 GLCD Display with Touch Screen is equipped with RGB backlight. It’s a whole new dimension. 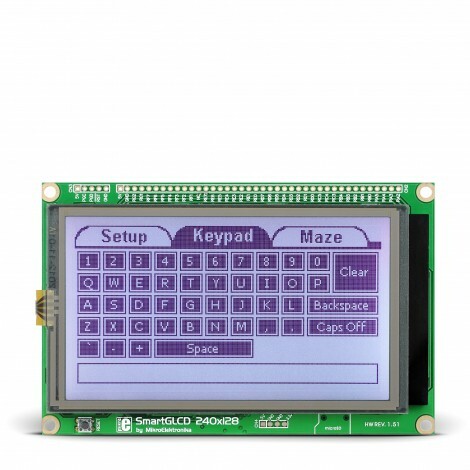 We have managed to squeeze everything you need onto a single PCB barely bigger then the size of the display. Having fast UART bootloader, this board is ready to rock right out of the box. No need for external programmers. You can save pictures, sounds and other media files on microSD memory card and use it in your application. On-board microcontroller is preprogrammed with fast USB UART bootloader, so it’s ready to work right out of the box. You don’t have to spend a dollar more on programmers. If you need a powerful debugger use mikroProg for PIC. SmartGLCD is fully supported by mikroC, mikroBasic and mikroPascal compilers for PIC. Examples written in each compiler demostrate every feature of the board. 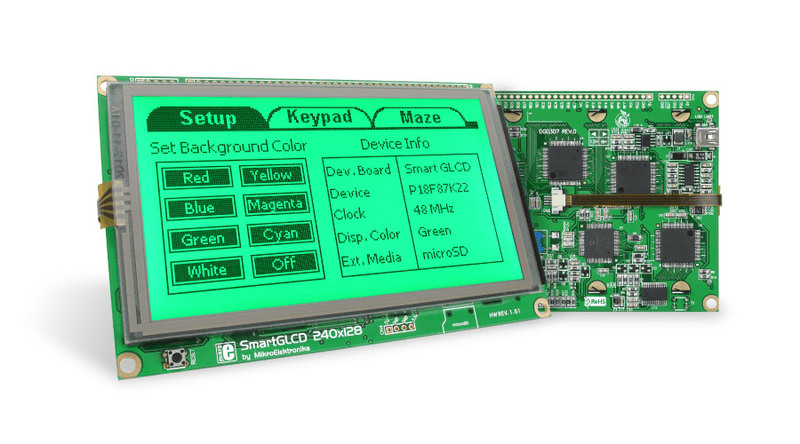 Easily create fantastic graphical user interfaces (GUI) for SmartGLCD in Visual GLCD software. Even beginners will be able to create amazing applications.